The guys over at Rovio have been hard at work producing something that they feel is up to the same standard as their Angry Birds phenomenon, and although we have known for quite some time that the game would give the gorgeous green piggies a chance to take the limelight, we are now seeing the official screenshots of the Bad Piggies game as it starts to hit supporting mobile app stores. It must be extremely difficult to produce a game that follows on from the phenomenal worldwide successes of the Angry Bird series, but Rovio is hoping that mobile gamers are ready to see some pigs fly. The new Android and iOS Bad Piggies game sees all attention lavished onto the enthusiastic green pigs as players need to guide their characters to the much sought-after eggs. 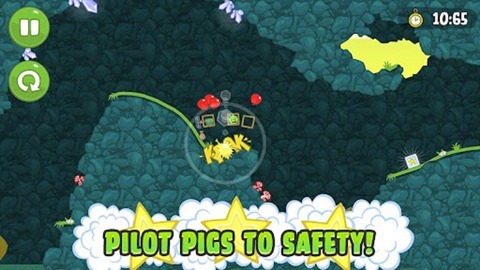 As you might have guessed, nothing is trouble free in the world of Rovio creations and unfortunately the pigs do need to dodge frequent perils in order to get their little trotters on the treasure. Gamers will be given the task of using over thirty different objects to create a flying machine that is capable of navigating the terrain to get the pigs safely to the eggs. 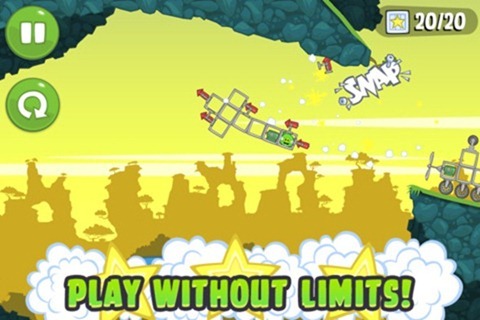 The barebones Bad Piggies game offers sixty fun-packed levels to users that are crammed to the rafters with flying, driving and smashing fun as the amateur crafted flying machines frequently fall apart. It is extremely likely that you will need to call upon the professional services of Mr. Mechanic Pig to get out of some sticky situations, allowing you to sit back and watch the vehicle crafted before your very eyes. If the base sixty levels don’t provide enough of a challenge, then three-starring them will unlock thirty additional puzzles. Rovio have been a little crafty with their level creation, users will find themselves having to play a level more than once to fulfill all of the objectives within in. Still, at least it sets a challenge and will provide multiple hours of gaming goodness as well as great value for money. As good as Bad Piggies is, it is highly unlikely that it can notch the same levels of success that Angry Birds managed, but it looks like a little blockbuster in its own.